We are a group of three couples - Canadian childhood friends who got together and bought our dream come true! We vacation in Cofresi when we can and love every minute of relaxation, beauty, and quiet beach village atmosphere! We love to be pampered on our holidays and feel this our 5 Star getaway! We bought our Penthouse from a Canadian Developer knowing other Friends in the Complex. Amazing Ocean Views!!!! Spacious King Size Bedrooms with full Ensuites and Ocean View from each Balcony. Large Outdoor balcony to entertain overlooking our private pool and spectacular views of the Ocean. Main Floor features 4th half bath. Playa Cofresi is quaint village located on the beach, with restaurant lined streets. Ocean World Adventure Park, Marina and Casino are a 2 min walk from our condo, offering many amenities. Breathtaking Ocean View from every window and balcony! Our condo is set in amongst the beautifully landscaped pools. Each bedroom is air conditioned. Laundry room off kitchen. Daily Maid Service. Please provide your own laundry detergent. Towels and beach towels are supplied. Comfortable and fully furnished with TV / DVD and the best view of the ocean ! Full service kitchen with lovely peninsula bar. Your personal English speaking maid, Mary Belle is available during the day. A very inviting dining area that opens to a large open air balcony. Enjoy the evening breeze overlooking Cofresi Beach and know why the Dominican keeps calling you back! Our balconies off each bedroom and dining and living room set us apart from every other condos in the complex......spectacular ocean views await you! Playa Dorada 18 Hole Golf Course, designed by Robert Trent Jones Sr, is located 20 minutes from our Condo. We can arrange a driver to take you to other golf courses. This beautiful Penthouse Condo is beautiful for couples or families. Our Complex features a large pool area and wading pool for children. Mary Bell, our Maid has been on site since the beginning and part of our Dominican Family. She arrives early in the morning to clean, do laundry,.....and will cook any meal you would like. You can pay and ask her to pick up up groceries for any meal. You will pay a mandatory fee of $3.00 usd per person per day, directly to Marabelle at the end of your stay. 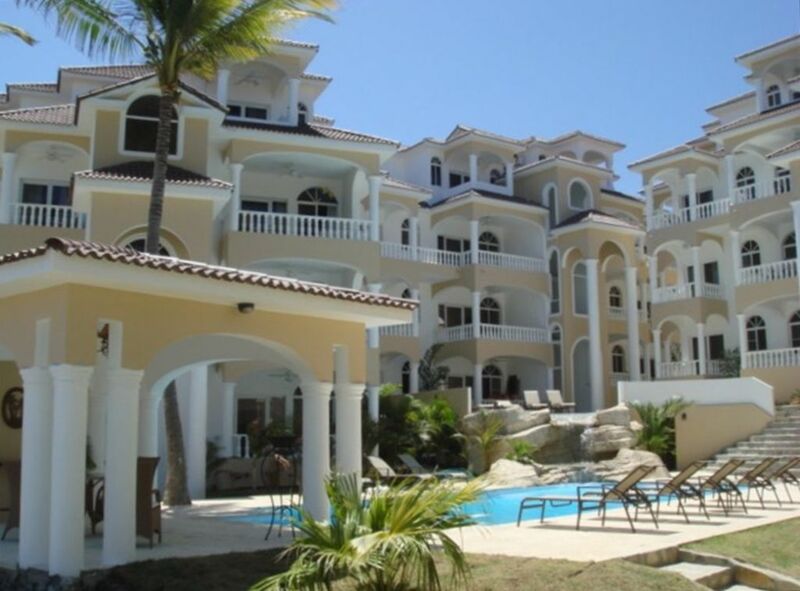 After a week's stay at an all-inclusive in Punta Cana, we travelled by van to Puerto Plata to spend ten days in this gorgeous, immaculately-kept, 2-storey condo. We loved the complex and would definitely come back to Club Paradise in Playa Cofresi. Our maid, Marabelle, shopped, made delicious meals for us and ensured that our living quarters were clean and tidy every day. Our driver, Rambo, was available to us any time we wanted to do anything in the area; all we had to do was call. The four balconies of our condo, overlooking both mountains and water, meant we could chase the sun or the shade at any hour of the day. We spent a great deal of time at the pool area, soaking up the sun and enjoying a cool, refreshing dip when things got too hot! There are many attractions in the area, both in the immediate vicinity and farther afield; a complete listing of excursions and venues in the region is provided by the owners. We were especially impressed by the restaurants just around the corner from the complex. Papillon, Los Tres Cocos and Los Charros were all within walking or short driving distance and provided three unique dining experiences we will not soon forget--excellent food and service in all three locations made for memorable evenings. The only downside was the loud music from the nearby public beach, which lasted several hours a day in the late afternoon and early evening. It would not be enough to keep us away in the future--we'll be back!--but it was a little difficult to escape the pounding beat at times. The volume seemed to decrease over the course of the week, so perhaps it is not a constant problem. It's also possible that we became accustomed to it and learned to relax in our surroundings, regardless of outside distractions. In any case, we thoroughly enjoyed our time in Club Paradise, Playa Cofresi, and we thank our hosts, Ed & Jo Tkachyk, for a delightful winter get-away. If all-inclusive stays are not your thing, give this VRBO rental a try! Glad that you all enjoyed yourselves. Marabelle and Rambo enjoyed your company and cannot wait for you to come back. You are all welcome anytime. Place was clean and comfortable, view was good as long as you did not look strait down at clutter. There was no hot water, but ended up not being a big deal as a cold shower was needed due to main living area not being air conditioned. Bedrooms did have A/C, so kept doors closed and they stayed cool. I heated hot water on stove to shave. Below balcony and across street is a vacant field cluttered with old pool furniture and restaurant equip. View was beautiful otherwise. Local street noise and "activity" about 100 feet away was a bother. Several nefarious characters hang around outside of building but never bother us. Unit was clean and (5) stairwells up. Pool was clean and grounds well kept. Security was there all day and night. conditioned . AC is generally only used for sleeping. I have contacted the owner of the vacant lot to continue with clean up. Thank you for your comments as we are always looking for ways to improve our luxury vacation home. Relaxing getaway in a spacious apartment. We thoroughly enjoyed our stay. The apartment was very spacious and the views were lovely. The pool was very nice and it was a quick walk to the beach, a local restaurant, and Ocean World. We felt very safe in this location and it was an easy drive to wherever we wanted to go and close enough to a local grocery store. We would return here again. We are so glad that you enjoyed your stay at our little piece of paradise. We hope you get the opportunity to come again and stay longer. Just steps from the business! We were very pleased with the apartment that is very easy to share with other people because of the lay out and the amount of private balconies. It was very clean and organized by the maid who also cooks great breakfasts. Also we were more than pleased that for a small added gratuities she agreed to cook for us during the day, dinners that we reheated at night. We bought what she needed and the typical meals were fabulous. The location is very close to the casino which also has an affordable restaurant. Other restaurants are nearby. The beach is right there and often busy with local people at the end of the day. The property is very well maintained and the staff is very friendly. We also hired the very helpful and accommodating taxi driver, an acquaintance of the owners. Be ready to think that James Bound will show up with the amount of helicopters transporting the guests of the luxurious resort across the bay, but the sound of the waves quickly comes back. We are so happy that you enjoyed your vacation. Thanks for the reminder that I should drop a note to the resort about their helicopters. We always enjoy the easy access to great restaurants and beach too! The listing description was right on key - the photos are true to the condo - the owner was great in helping us with fun things to do - she answered all our questions - I would recommend this property to anyone - if the opportunity arises again we will definitely go back - Ocean World was great - very clean - lots of restaurants within walking distance - a fantastic pizza just around the corner - Rambo picked us up at the airport and also took us back on the day of our departure - he was super - Maria is the greatest! My spanish is like zero - but she cooked everything we asked - she is really really great. Everyone at the condo was very nice - when I go back I would really like to stay for at least 3 weeks - very peaceful place to relax! Glad to hear you enjoyed your stay Priscilla. On your next stay you will have to try some of the great restaurants that are just a short drive away. I also find that my lack of Spanish is no hindrance to having a great time, everyone is just so friendly and willing to help. A short walk to the Island's only Ocean World Adventure Park, Marina and Casino. Be sure to visit the the waterfalls only a short drive away. Take a short drive to Cabarete to see the kites in action. A great day of shopping, restaurants and lazing beach await you. Arrange for our driver to take you.